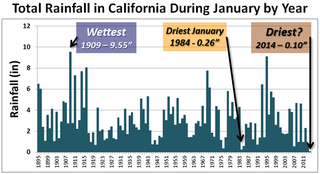 California's driest year in 500 years? The mainpage mentions California's current drought without mentioning how severe it may be. As the above image shows, January of 2014 is on track for being the driest January since records began in the 1890s, beating out 1984, the previous driest January. But paleoclimatology is a thing that exists, and while it can't give us as precise of data as recorded measurements can, it can give us good estimates spanning back centuries or millennia or millions of years further back in time than recorded measurements can. What does the paleoclimatology say about California's current drought? "This could potentially be the driest water year in 500 years," says Ingram, a professor of earth and planetary science and geography. Ingram has an especially long-term perspective. As a paleoclimatologist — a scientist who studies changes in climate by teasing data out of rocks, sediments, shells, microfossils, trees and other sources — she's accustomed to looking back over eons. And according to the width of old tree rings (which can record the coming and going of wet or waterless stretches), California hasn't been so parched since 1580. That's fairly serious. That might be a point of data to start an article about the severity of the current drought with, but it appears that only phys.org and a blog based out of Redding, CA have done so. Top and bottom image both courtesy of the US Drought Portal, which for some reason is also only comfortable talking about recorded measurements.